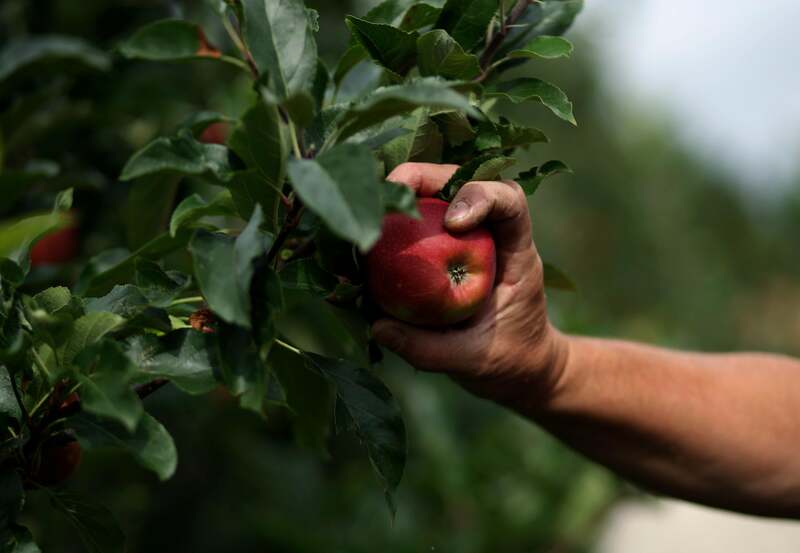 What pick-your-own-apple orchards teach about the American economy. Why pick-your-own orchards are a wasteful scam. Photograph by Miguel Villagran/Getty Images. A few weeks ago, the New York Times ran a poignant article about anguished fruit farmers in California. Because of a crackdown on illegal immigrants, they couldn’t find workers willing to pick their pears, even at $150 per day. And as a result, perfectly good fruit rotted in the fields. Perhaps the California farmers, who depend on migrant Mexican labor, have got the wrong business model. Instead of paying workers to pick their fruit, they should try another strategy: making customers pay to pick the fruit themselves. Savvy farmers all over the country have discovered a practice that might not work as a nationwide agricultural policy, but that has allowed some economically inefficient orchards to thrive: Encourage yuppies and their progeny to come pick your fruit—they’ll pay handsomely for the privilege, buy more than they’d ordinarily consume, and then shell out for all sorts of other value-added products. It’s the best use of child labor since Manchester’s early 19th-century textile mills. Apple picking is a cherished rite of fall, a wholesome and fun family outing, a throwback to a simpler time when people weren’t so disconnected from the production of their sustenance. I look forward to it every year. It’s also a wasteful scam. We’ve been educated (or bullied, depending on your outlook) by foodies like Alice Waters and Dan Barber to adopt the European concept of terroir—the best stuff to consume is the stuff grown in closest proximity. For people in the Northeast, that’s fine in the summer, when the Union Square greenmarket bursts with locally grown exotic greens, yellow squash, and heirloom tomatoes of such flavor (and cost) as to make a gourmand weep. But in the fall, while the region’s landscape lights up with foliage, the farm stands’ color palette becomes more drab: potatoes, root vegetables, pumpkins, gourds, and, of course, apples. And so, to the pick-your-own orchards we go. Silverman’s Farm, the farm I frequent in Fairfield County, Conn., is a pick-your-own farm for Type A’s: a high-volume, diversified joint. It attracts pickers from New Haven, New York, and all points in between. (You can rusticate and still be back to Park Slope in time for dinner.) Several tractors take turns hauling wagons with families up the slopes, and then back to the large store, where pumpkins, jams, ciders, pies, and flowers are sold. After jostling through the crowds—gaining access to the choice apple trees and a quick checkout lane requires the same level of competitiveness, foresight, and sharp elbows as winning admission to top nursery schools—it’s across the street to the petting zoo for the exquisite pleasure of having llamas and goats lick pellets out of your hands. On Sunday, we experienced a more laid-back, echt version of apple-picking on a postcard-perfect day at Bartlett’s Orchard in the Berkshires. The apple-picking experience sheds light on some unflattering truths about the American economy. First, we regard nature as a realm to be conquered and tamed for our recreation, not to be preserved and nourished for its own sake. At the orchards, kids are instructed on how to pick apples—twist them gently—in such a way that leaves the tree intact. (Of course, for every child who closely adheres to the instructions, there’s another who shakes the branch heartily, sending a cascade of smaller apples, leaves, and branches down to the ground.) But these trees are hardly natural. They aren’t the sort of majestic, voluptuous apple trees you would have found in the Garden of Eden. They’re dwarf apple trees, stumpy bushes engineered so that their fruit grows just a few feet off the ground. They’re the veal calves of the fruit world. In the United States, overconsumption is encouraged as a positive good (see under: McMansions, SUVs, all-you-can-eat buffets). Add pick-your-own apples to the list. At Silverman’s Farm, pickers have a choice: $14 for a small bag and $24 for a large bag. At Bartlett’s, it’s less: $9 for a peck (10 pounds), $15 for a bushel (20 pounds). But even though consumers here avoid all the supply-chain costs they would pay at a grocery store, it’s not that much cheaper. At Peapod, a three-pound bag of apples goes for $2.79, about 93 cents a pound. Apple-picking also makes us vulnerable to that peculiarly American malady: the paradox of choice. Sophisticated American consumers must develop the ability to pick and choose among hundreds of varieties of wine, cheese, chocolate, and coffee. Well, like everything else in life, apple connoisseurship can be reduced to a convenient spreadsheet. Did you know that Granny Smith apples are tart and are superb for pies but poor for sauce, while Sun Crisp are tangy sweet and are very good for salad but only fair for pies? And how can you keep track of all the different varieties once they’re in the bag? If you thought comparing apples to oranges was a fruitless endeavor, try comparing apples to apples.